What would you say if someone came up to you and asked you how to inherit eternal life, or how to be saved? Many people believe in having a set answer, a ready-made formula. Did you ever notice, though, that Jesus didn’t have a ready-made formulaic answer when people came to him with those kinds of questions? This month we will be looking at one of the core stories of the New Testament: Jesus’ parable of the Good Samaritan. This story resulted from a man coming to Jesus with a simple question – what must I do to inherit eternal life? The story Jesus told explains what it looks like to be saved, to have the love of God in your heart and extending that love to people across all boundaries. 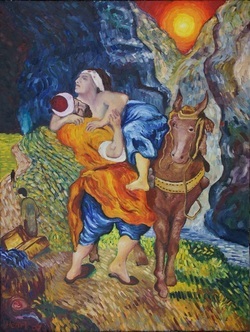 "Parable of the Good Samaritan"
"The Good Samaritan (after Delacroix)"
"The View From the Ditch"